On the trail of malevolent space pirates, Curt Newton and the Futuremen combat the evil machinations of the Uranian Ru Ghur, who plans the total destruction of the Universe! The Captain Future saga follows the super-science pulp hero Curt Newton, along with his companions, The Futuremen: Grag the giant robot, Otho the android, and Simon Wright the living brain in a box. Together, they travel the solar system in series of classic pulp adventures, many of which written by the author of The Legion of Super-Heroes, Edmond Hamilton. On the trail of malevolent space pirates, Curt Newton and the Futuremen combat the evil machinations of the Uranian Ru Ghur, who plans the total destruction of the Universe! 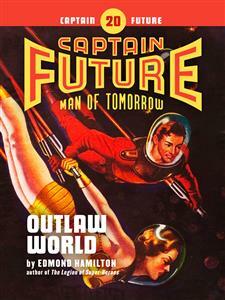 “Outlaw World” was originally published in 1946. No part of this book may be reproduced or utilized in any form or by any means, electronic or mechanical, without permission in writing from the publisher. DANGER was like a physical presence in the Orion, as the old space-freighter plodded through the lonely void. The ship was running dark, even its rocket-tubes baffled so that no betraying flare of flame would mark its course as it droned on the long voyage from Saturn toward Earth. In his cubby, the telaudio operator, a dark-haired, clear-eyed, tanned young Earthman, alertly listened at his instruments. “Planet Patrol calling all ships between Saturn and Jupiter,” issued a sharp voice from the loud-speaker. The operator made no attempt to answer. He had strict orders to maintain telaudio silence. As the operator jumped to his feet he heard a shrill shout from the lookout man forward. The telaudio man leaped for the door, plunged for the bridge-room. Captain Greeley, the grizzled old Earthman who was master of the Orion, was already there. He was peering through the small round lens-window of the aft televiewer, a powerful telescopic instrument. The window was an eye peering into space, a dark abyss hung with the jeweled tapestry of the stars. Saturn was a yellow spark astern. Jupiter lay ahead, and beyond it the asteroid zone glinted against the flaring little Sun. The telescopic window showed what the unaided eye could not see—four long, slim cruisers, running dark, pursuing the Orion. The stubby muzzles of heavy atom-guns that protruded from the sides of the cruisers were clearly recognizable. “The Patrol just flashed warning that radium raiders are operating in this sector, sir!” rapidly reported the telaudio operator. “Full speed on all cycs!” Captain Greeley shouted to the pilot. The throbbing of the cyclotrons down in the lowest deck instantly intensified to a roar. The old freighter quivered to the increased thrust of power from its stem rocket-tubes. AS THE young operator raced back, his own mind was grappling with the mystery. The radium raiders who had first appeared a month before were the enigma of the Solar System. In bands of up to a half-dozen cruisers, they pounced upon and looted unarmed freighters, then disappeared as magically as they came. Space pirates were no new thing, to the System. There were always some corsairs infesting the outlaw asteroids or the wilder moons of the outer planets. But these radium raiders were different from any other pirates ever before encountered. They sought only radium, the most valuable substance in the System, the element necessary for so many industrial and scientific power projects. Much radium was mined on Saturn and Uranus and transported to the inner planets. The raiders had cut off almost every such shipment. No matter how secretly a radium ship took off, they seemed to have knowledge of its movements. Greatest mystery of all was the raiders’ origin. They did not come from any known part of the System. That had been established by Patrol searches. They seemed to enter the System from above the planetary plane, and to drive up out of it after each foray. Did they come from some interstellar lair far across deep space? Or were they from another dimension entirely? These, and wilder surmises were afoot. “Freighter Orion to all stations and squadrons of the Planet Patrol!” shouted the young operator into his microphone. There came a flash of brilliant light outside the windows of the speeding ship, a glare that lit up all space for a second. “They’re within range!” a yell rang through the ship. The operator glanced swiftly through the port-hole and glimpsed a scene to bring a chill to the stoutest heart. The four black cruisers, rapidly overtaking the fleeing freighter, were using their heavy atom-guns. He glimpsed a shower of atom-shells rushing toward them. Then another blinding blaze of light, a quivering shock through the ship, and the roar of an explosion. The explosion had flung the telaudio operator to the floor. He heard rending metal, the shriek of escaping air, the clang clang of automatic bulkheads closing to prevent its escape. The Orion’s stern rocket-tubes had been ripped into junk, and a back-blast along the power pipes had exploded the cyclotrons. The raiders’ four cruisers drew swiftly abreast the disabled Orion as it sagged helplessly in space. Magnetic anchors shot out to grapple the freighter and draw it close by raiders. Then men in space-suits, heavily armed, came leaping across the narrow gap and swarming into the wrecked freighter. Resistance was out of the question. The few stunned survivors were overwhelmed. Only the telaudio operator continued to shout into his instrument, rattling off their space position. A crackling bolt of atomic energy speared past his head and tore into the metal wall. “Get away from those instruments!” ordered a smooth voice. The operator slowly turned from the telaudio and raised his hands. A dozen raiders had crowded outside the cubby. In their black space-suits they were a grim interplanetary band. The leader was a fat, moon-faced man who turned to give orders. He turned back to motion the telaudio operator out of the cubby. And the young Earthman was thunder-struck as he glimpsed the leader’s face inside his glassite helmet. FROM where did the mysterious radium raiders come? Though that question had alarmed the whole Solar System, no one could do more than guess at the origin of these dangerous marauders. There were wild rumors of an unknown planet where the radium raiders had their base, an Outlaw World. But where was that Outlaw World? Not even the Commander of the Planet Patrol could answer that. In his headquarters in New York, on Earth, Commander Halk Anders’ bulldog face was grim as he admitted his mystification to two trusted aides. Ezra Gurney, white-haired, black-eyed old veteran marshall of the Patrol, spoke in a skeptical drawl. Ezra pointed up at a huge wall chart of the Solar System that depicted all its worlds from Vulcan, the little solar satellite, out to distant Pluto. The second of his two aides, a dark-haired girl, ventured a suggestion. Slim and lovely in tailored space-slacks, she looked out of place in these grimly military surroundings. Yet Joan Randall, ace secret agent of the Patrol, was one of its most brilliant minds. The Commander knew that. It was why he had called her and her old comrade, Marshal Ezra Gurney, to this conference. He was interrupted by the entrance of an excited young officer in the drab gray uniform of the Patrol. Halk Anders instantly touched a switch, connecting his desk interphone with the main telaudio room. “Cut me into the Orion’s call!” he ordered. Suddenly there came from the instrument the sound of a explosion and the crash of rending metal. Sounds from is telaudio of the ship that was being attacked five hundred million miles out in space! As the operator yelled the coordinates above the din, the Commander shot an order at the officer who had brought him word. The Commander listened tensely, but no further sound came from the Orion’s telaudio. Joan Randall’s brown eyes suddenly flashed with excitement. From the loud-speaker issued an almost imperceptible sound of light tapping, irregular in rhythm. The code message stopped there, abruptly. And there came a report from the main telaudio room. HALK ANDERS and Joan and Ezra hardly heard him, for they three were looking at each other in stupefied astonishment. The Commander’s eyes narrowed. “Nobody ever saw that Uranian’s body,” he muttered. The suggestion appalled them. For the very name of the master scientist of crime cast a chill shadow which they had believed lifted from the System. Ru Ghur of Uranus had been a very great scientist, indeed. He had been a master, especially, in the study of radiation and its effects. But he had turned his most brilliant discovery to evil ends. For he had discovered a ray that had a strange effect. That subtle radiation brought dreams to the mind, dreams that seemed utterly real, that brought true all the subject’s dearest hopes—while the dreams lasted. Ru Ghur had called it the “Lethe-ray”, and he had sold it to people who wished to drug themselves with dreams. Under its influence, they attained their heart’s desire—in visions that seemed real. But the ray was soul-destroying. If its use was continued for long, its victims could not live without it. This infamous traffic had numbered victims by the hundreds. Then Captain Future, the young Earthman who was the System’s greatest scientist-adventurer, had stepped in. He and his comrades, the Futuremen, had broken up Ru Ghur’s evil traffic. They had relentlessly pursued the Uranian scientist until he had fled out of the System and had been considered dead. It lacked minutes of the hour she named when the small torpedo-shaped cruiser in which she and Ezra had left Earth approached the rugged, rocky surface of the Moon. This forbidding, airless satellite of Earth had only four inhabitants—Captain Future and the Futuremen. “He was born here, remember,” Joan reminded. Years before, a brilliant young scientist, Roger Newton, and his bride had come to the lonely Moon for refuge from enemies. With them had come Simon Wright, the Brain, who was Newton’s colleague in a great experimental attempt to create intelligent living beings. Here they had built an underground laboratory home. Here, they had artificially created two intelligent living beings—a mighty robot and an android, or synthetic man. And here an infant son had been born to Roger and Elaine Newton. Then tragedy had struck. Their enemies had followed them to the Moon. The young scientist and his bride were slain. And the infant, Curtis Newton, had been left in the care of the strange trio, the Brain and the robot and the android. THEY had given him the wonderful education which had made Curt Newton not only a wizard of science but also the most daring and resourceful Planeteer who had ever taken the spaceways. The whole System had come to know him as Captain Future, a laughing, red-haired young Earthman who made it his mission in life to crush interplanetary criminals, and attempt to expand human empire to the stars. Joan made no retort, busy bringing the cruiser down into the giant ring of Tycho crater. Upon the sun-scorched floor of the mighty crater glittered a circle of smooth glassite. It marked the underground laboratory of the Futuremen. Joan landed close by it. Hurry, Ezra,” she urged, as she got into her space-suit. The veteran and the girl emerged from the cruiser and tramped toward a cement stairway that led down beneath the lunar surface into a large airlock. Startlingly, a giant metal figure suddenly loomed up to confront them. Grag was, to them, a familiar figure. To unexperienced eyes, he would have seemed awesome—a massive, manlike figure of metal, seven feet high. His giant legs and arms plainly hinted at the prodigious strength that was unmatched in the System. But Grag had more than mere strength. In his metal head was a complex mechanical brain that made him more than a robot. Intelligence shone from his two glowing photoelectric eyes. His mechanical voder-voice boomed in glad greeting. They had passed through the airlock and now could take off their helmets, for they had entered the air-filled laboratory, the heart of an underground citadel of science. It was a big, round room, lit by a flood of sunlight from the glassite ceiling window. Towering machines and instruments crowded it. Doors led to store-rooms, living quarters, and the underground hangar of the Futuremen’s famous space-ship, the Comet. But the only occupants of the laboratory were the two queer little animals scuffling playfully in a corner—Eek and Oog, the pets of the Futuremen. “Where’s Curt?” Joan asked the big robot. The other two Futuremen had just entered—Otho, the android, and Simon Wright, the living Brain. Otho was the most human-looking. Indeed, he was a human in almost every sense of the word except that he was an artificial man, one created synthetically in this very laboratory. He was of middle height, lithe and agile, with a pale white face whose sensitive and intelligent features were most remarkable for the slanted, jade-green eyes that always had sparks of deviltry and recklessness in them. “Nothing’s wrong is it?” Otho asked the girl and the old marshal quickly. “What is it, Joan?” the Brain asked in his metallic voice. The Brain was the strangest of the three Futuremen. Yet he had once been an ordinary human. He had once been Dr. Simon Wright, a renowned, aged master of science who had been dying when a miraculous operation had been performed. His living brain had been transferred into a serum case, in which it had dwelt, unaging, ever since. NOW the Brain resembled a square, transparent metal case, upon whose “face” were his lenslike glass eyes, his microphone ears and resonator speech apparatus. He hovered six feet above the floor, for Simon could glide through the air by means of magnetic traction beams which he could also use as arms and hands. “What is it that’s wrong?” he asked sharply. “Curt went out after the raiders without you Futuremen?” Joan exclaimed, surprised. “But you don’t know that the head of these radium raiders is Ru Ghur, the Uranian!” Joan said quickly. It was a bombshell to the Futuremen. The name of their deadliest enemy, the man whose infamous “Lathe ray” traffic had started their greatest struggle, electrified them. IN THE crippled Orion, the young telaudio operator of the freighter stared in amazement at the leader of the radium raiders. For that operator was none other than Captain Future! He had dyed his red hair, before obtaining his position on the radium-carrying ship, hoping to get on the raiders trail. “You’re Ru Ghur—but you’re dead!” he exclaimed incredulously. “Ah, so you know who I am?” the Uranian raider leader said softly. Ru Ghur was a fat man—fat almost to grossness. His squat, tubby figure looked even more bulky in his shapeless space-suit. With his moonlike yellow face and bald head he looked the picture of a fat, friendly and harmless man—all except his eyes. They were black and bright and merciless, mirrors of the man’s brilliant intelligence and remorseless. They bored into Curt Newton’s. Captain Future tensed. He knew the danger of the Uranian’s sharp eyes penetrating his disguise. Curt Newton’s mind was seething from the shock of discovery that Ru Ghur was leading the raiders. Even the facts that the raiders had tracked down the ship, though Curt had detected no spies aboard, that the Orion was in their hands, and that his own life was imperiled, were unimportant beside the knowledge that this dangerous criminal was alive. At all costs, the Futuremen and the Patrol must be warned of Ru Ghur’s return. The telaudio circuit was still open. But an attempt to speak a word into its microphone would mean instant death. Captain Future let his hand fall idly to the microphone. His fingernail inaudibly tapped its edges, spelled out a message in standard interplanetary code. Ship taken—leader of radium raiders is Ru-Ghur. As he tapped, Curt Newton spoke loudly to the Uranian to distract his attention. “What are you going to do to us prisoners?” he demanded. “Can’t you just leave us here in the wreck?” Captain Future asked, as he kept up his surreptitious tapping. The Uranian shook his head sorrowfully. “No, no, it wouldn’t be wise to leave you alive, possibly to give information to the Patrol. I’m surprised…. Get your hand away from the microphone!” He had detected the signaling. Curt Newton realized the game was up. There was just one chance left, and he took it. His hand reached for the proton-pistol inside his jacket with blurring speed. Too late! Ru Ghur, whose atom-gun was already in his hand, had too big an advantage for even Curt’s phenomenal draw to overcome. But the fat Uranian didn’t shoot. He merely struck with viper-swiftness, his weapon’s barrel crashing against Curt’s skull. The Uranian’s followers were men of almost every planetary race—brawny green Jovians, thin Saturnians, wizened, swarthy Mercurians, vicious-looking Earthmen. Pirates, outlaws, all of them. Curt Newton felt them pinion his arms, without being able to resist. His small, bright eyes ran over his prisoner, from head to foot. He saw a six-feet-four young Earthman whose lean body was that of a fighting man; dark, curly hair, a space-browned, handsome face; and gray eyes that now were dazed and clouded.